Push is a 2009 American science fiction thriller film by filmmaker Paul McGuigan. The film stars Dakota Fanning as Cassie, Djimon Hounsou as Carver, and Chris Evans as Nick. The plot centers a group of telekinetic people who band together to attempt to take down a government agency that is transforming normal citizens into powerful psychics. Powers include the ability to see the future before it happens, create new realities, amongst other powers. 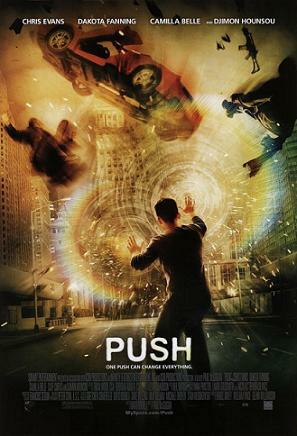 Push received generally negative reviews by critics on its original release with critics claiming the film to be “visually flashy but hyperkinetic and convoluted”. This sci-fi action film involves a group of young American expatriates with telekinetic, telepathic, and clairvoyant abilities, hiding from a clandestine U.S. government agency referred to as “Division.” They try to find the only woman that ever escaped from “Division”. She is their only key to finding out how to escape the agency. They must also use their different talents and band together for a final job enabling them to escape the agency forever. ~ by darkdestroyer on February 7, 2009.
iv’e heard mixed reviews with this film. I think i will need to see it to make up my own mind.